I’ve been using the kitchen in a somewhat functional state for a while now, so I thought it might be a good opportunity to finally share some of its details. It’s always tricky to review something that you just installed and are happy with, but what really matters (to me, at least) when I read reviews online is the timing; now that you’ve owned a product for a year, two years, etc., would you still make the same choice? So, for today, let’s get a closeup at one of my favorite spots in the house: the sink area and kitchen faucet. The kitchen may have taken a while to come together, but thanks to my uncle’s help back in 2013, I was able to get the butcher block counter, sink, and new faucet installed in just a few days. 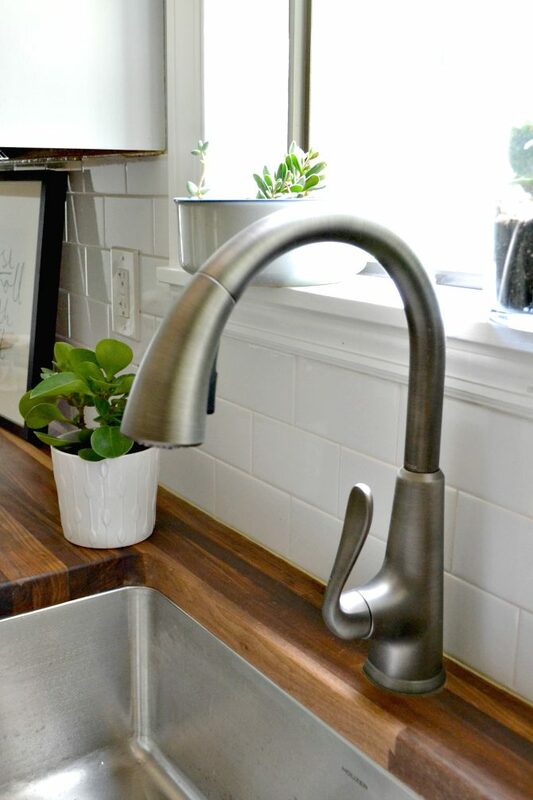 The faucet I picked was at a time back when I was working with Pfister on a random blog campaign (I used their products before for the guest bath and really liked them), and they had a new finish they wanted to try out. 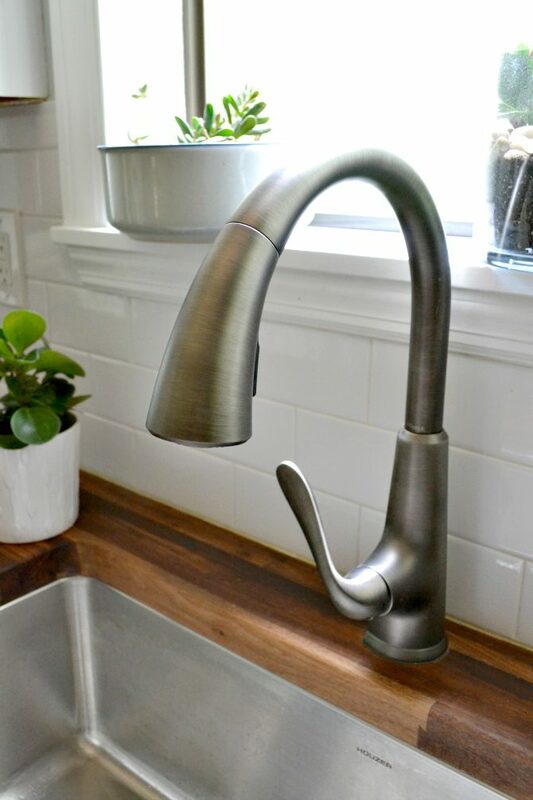 So, I wound up finding a single-handle version I loved, and they shipped it over to me: the Pasadena Single-Handle Pull-down kitchen faucet in Slate Finish. The main feature about the “slate” finish itself is that it’s kind of like if stainless and satin nickel had a baby. It’s specifically designed to not show water spots or finger prints, which I can’t even begin to tell you how nice that is to have (especially because by comparison, the sink is stainless and regularly shows water spots, even though I’m still very happy with that choice too; between that and keeping water spots off of the butcher block itself, I already have enough maintenance to look after). I don’t have a lot of issues with mixing metals, so the fact that I have this finish mixed in with satin nickel hardware and a stainless sink goes unnoticed by me on a day to day basis. The end of the faucet has a hidden pull-down, which automatically retracts back into the faucet when you let go, but doesn’t do it so quickly that the tube whips back into place (which I actually like, since that much splashing around would mean water spots on the wooden counter). It also has a push button along the back to allow for a weaker spray if needed. You may have noticed (but perhaps only because I’m pointing it out, but the handle is installed on the front of the faucet rather than on the side. That was some good, ol’ fashioned problem-solving that we did during installation; between the hole placement for both the faucet and fitting the new, larger sink, the handle would have bumped up against the backsplash and prevented me from having a full range in temperature. 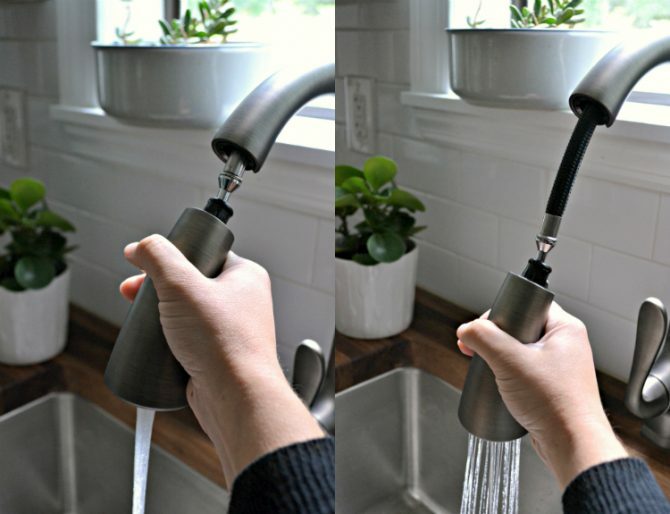 The quickest and easiest workaround was to turn the base of the faucet to the side and position the handle right along the front — and so far, the only people who have ever made comments about it thought it was actually pretty cool, as though it had been designed that way on purpose! I still have to do a couple of smaller things around the sink, such as re-caulking along the back of the counter, filling in a few nail holes, and possibly sealing the lip of the undermount sink with a more heavy-duty sealer rather than using the oil mixture I use for the rest of the butcher block countertop. A few folks have asked about water around the sink area and how the beeswax/mineral oil and everything has worked out, and my general answer is that it’s what I expected. I wouldn’t call it hassle-free because I have to wipe it down if things get splashed around, but in general, it’s not as much of a headache as people have assumed. Sure, there are some water spots that will appear if I don’t catch things immediately, but they also disappear again as soon as I treat the area with more oil. You can get all the details on how I treated the counters here, if you’re curious! And if you ever wanted to see a short house tour of what everything looked like as it was getting installed, you can also see that video here. It’s been a couple of years now, with no leaks, no issues, and very little thought. Which when it comes to things like a faucet you use every day, not having it on the list of things I need to think about is a pretty nice detail. 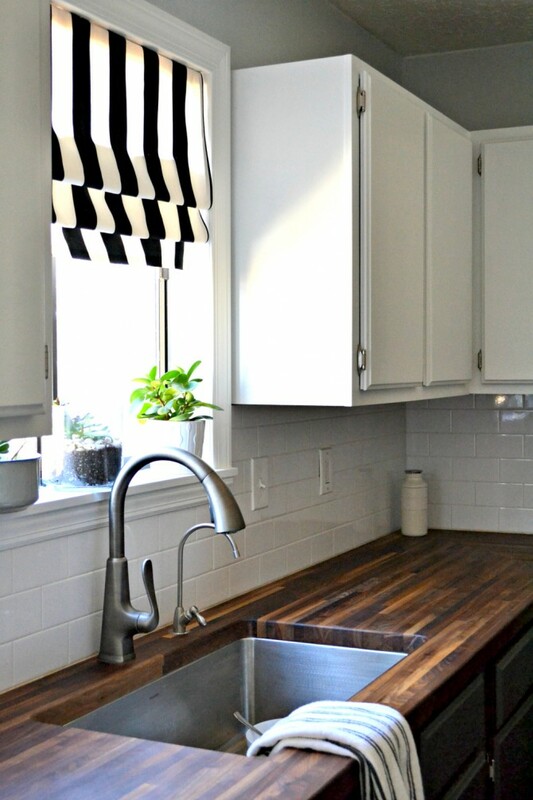 Want more info on my kitchen makeover? Check out the highlights in my house tour page here. 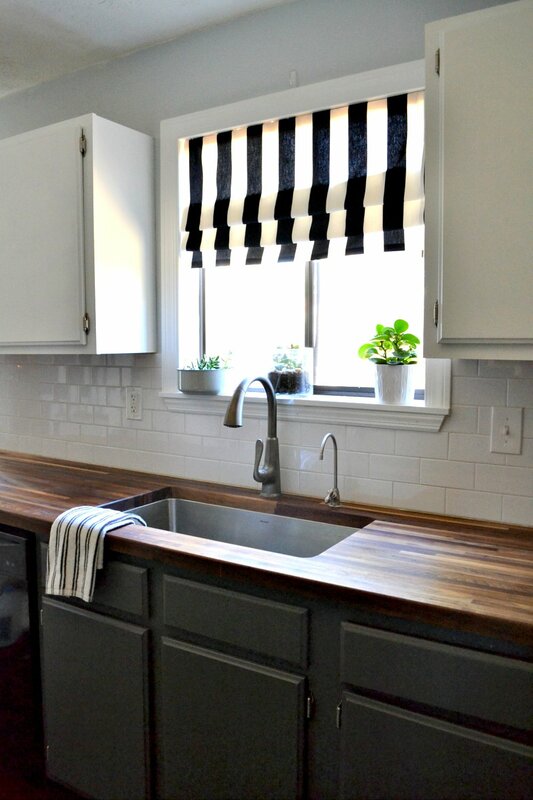 You can also browse back to my Dueling DIY posts on the kitchen as well as simply scroll through everything I’ve ever posted about kitchens by checking out the archives right here (if you have that kind of time!). Have you tackled your kitchen renovation yet? What are you most looking forward to changing? P.S. In case it wasn’t clear in the info above, in full disclosure, the faucet was provided to me several years ago at no charge, which I mentioned back when the kitchen was first coming together. I decided to just post a review about this faucet today simply because I am always curious about how people like the things they install after they have really had a chance to test things out, and I pore over reviews constantly before making a purchase that I know I’ll use for a while. Hope this helped! P.P.S. Speaking of faucets, the Delta Pro contest that I was a guest judge for now has a winner! 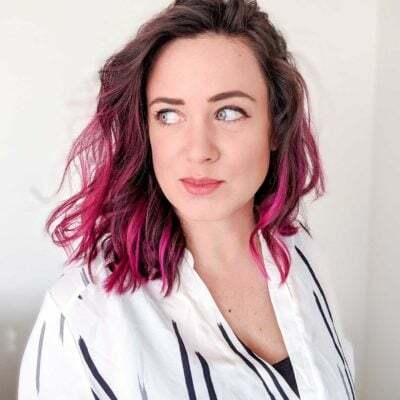 She has kindly sent me some of her makeover photos and I’ll be featuring one or two of her projects soon here on the blog (no particular reason, just that makeovers are fun to see!). If you’d like to share your own makeover with me for a chance to be featured, send photos and your makeover story to my email. We installed this same faucet with our new granite counters, however I had the handle positioned on the right since I am right handed. Big mistake! Now, after daily use, I find that my hands are usually wet when working with the handle causing water to pool on the granite under the handle. I am always wiping up the puddle. You were so smart to position your handle as you did! I thought the handle was on purpose and ingenious. I am always wiping up water from turning off the faucet with wet hands. This solution makes sense for a lot of reasons and looks great! Hi! I hope this doesn’t come across as rude: but, I think you mean “pore over”, not “pour over”, when reviewing comments. Thank you, btw, for the great ideas on your site…especially the clever laundry room and the faucet mounting above. I have the same faucet and it’s mounted with the handle to the right, which is annoying to my left-handed husband. I’ll have it redone the next time my handyman is here! (My husband is a whiz at computers, but handy he is not. I’m even less skillfull with a screwdriver or wrench!) I so enjoy seeing what you can accomplish! Thanks! 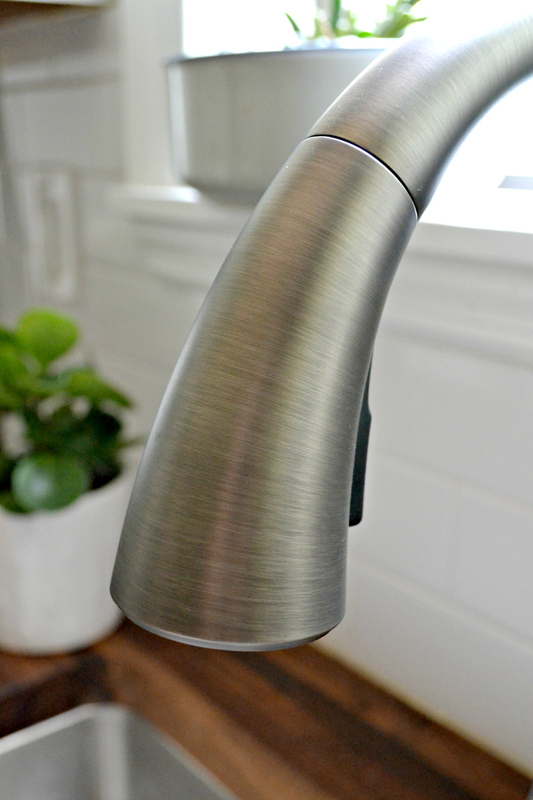 The details of your kitchen faucet is really cool. I’m sure a lot of here already are inspired to change their faucet and get some minor renovation of their kitchen. That’s exactly what I am feeling right now. Thanks for showing this to us and for giving us an idea on how to achieve it. When you turned the faucet around so the handle is in the front did you have to do anything different or special for the installation? I need to have that handle in the front also. We ar total newbies in the area of plumbing but I believe we can install a new faucet. Not in regard to the side-turning, as far as I recall. Most of the hookup happens below the faucet down in the cabinet, and most faucet tubes are pretty flexible (it’s an uncomfortable space to work in, but the tubes are usually long enough to accommodate most cabinets and plumbing). I did have to redo some plumbing underneath and had my uncle help with most of it, but that had more to do with needing to make room for a new garbage disposal and water filtering system on the side and less to do with the faucet itself. Good luck on your install!